Taking Anti-Racist Action: Why Rare for Whites? A participant was directed to a room where two actors posing as fellow participants — one black, one white — waited. The black person said he needed to retrieve a cell phone and left, gently bumping the white person’s leg on the way out. The white actor then did one of three things: Nothing. Said, “I hate when black people do that.” Or used the N-word. The researcher then came in to start the “study” and asked each participant to pick the white or black person as a partner for the study. Students who actually experienced the event didn’t seem bothered by it — and nearly two-thirds chose the white actor as a partner, the researchers reported Friday in the journal Science. “It’s like these nasty racist comments aren’t having an effect,” said York University psychology professor Kerry Kawakami, the lead author. . . . The study can’t say why people reacted that way, although the researchers speculate that unconscious bias is at work. The magnitude of the results surprised even the authors, Kawakami said. Experiencers reported little distress in all three scenarios . . . . “Even using that most extreme comment didn’t lead people to be particularly upset,” said co-author Elizabeth Dunn, assistant professor of psychology at the University of British Columbia. Even white researchers working on racism issues like this seem to be unaware or unreflective about how fundamental and widespread the white racial framing of North America really is. A great many whites react this way because they in fact do think in blatantly racist terms about black people (but may reserve openly racist comments for white backstage areas) or because they do not find the racist actions of others to be “serious,” especially serious enough for them to intervene in and risk losing a friend or acquaintance. Leslie Picca and I found this reaction to be commonplace. Nowhere in our 9,000 diary accounts of racial events from 626 white college students at 28 colleges and universities is there even one account of whites, including the student diarists, assertively protesting a case of racial discrimination by white actors and authorities in a frontstage setting. 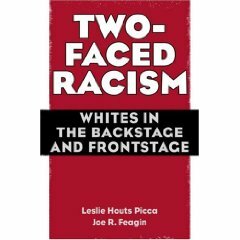 Only occasionally in the journal accounts do we even see whites, the students and other whites, engaging in sustained or assertive verbal dissent to the racist performances of friends, acquaintances, and relatives in the backstage settings. Just a few student journal accounts show one or more whites aggressively confronting other whites’ racist performances and interactions backstage. This lack of assertive confrontation was true for the journal writers themselves, even when they later said that they should have intervened. Many of our white college students commented later in their diaries that they recognized their friends and relatives were indeed doing racist stuff, but said they were still “nice people” to be with–that is, whites doing even extreme racist performances are given a “pass” and viewed at though they are doing something relatively harmless, like picking their nose. Reviewing thousands of accounts that the college student writers provide, we estimate that no more than one percent indicate that at least one white person in a setting took some dissenting action, such as a strong verbal demurral or more active counter at the time of a racist incident. In the rare cases, white women were more likely than white men to try to hold other whites accountable for their actions. Our research also suggests that anti-racist action can be (modestly) socially costly even for privileged whites, such as losing friends, which is one likely reason it is rare even for whites who know racism is quite wrong. At least our students see such anti-racist action as potentially costly for them. Group think. Group self interest. Group vested interest. Darwinism. Self serving. As such then, the non-action of some whites in holding other whites responsible for their racists actions/ideas is not at all surprising but rather expected. What you have here is not necessarily evidence that white people only act against racism to protect family and friends. I would argue, speaking from personal experience, that these white people may have started with the principled (and abstract) commitment to racial equality, but soon found that taking a stand against racism meant losing many white members of one’s friends and family who were not similarly committed. As these white people lose white friends and complete their “transracialization,” they get, by default, more friends, partners, etc who are not white. So the white people defending people of color they are close to may have once been the same people you are looking for. I’m wondering if the black confederate was outside of the room (“didn’t hear”) the comment or inside the room. I read the AP report, and am not sure about this in their protocol. Anyway, it would make an interesting condition for future studies. Louise, that is a good point. One gains too more than new friends too by breaking with racism, one gains a better moral position. Pitseleh, I cannot tell about the structure of the experiment either. Thanks for this post. As a white woman married to a black man, with multi-racial kids who are, of course, seen as black by most of our culture- I take an aggressively anti-racist approach to life. Sure, its cost me friends, some rough encounters with law enforcement, lost me clients, but is there really an alternative? Honestly, I think my earlier work (prior to mom and parenting) as an anti-oppression,. anti-racist ally (through TODOS- now defunct Oakland organization) made me realize that committing to life as an ally would be both uncomfortable and amazingly enriching. That said, the seeming paradox of both benefiting from and rejecting the complicity of white privilege has led to me feeling a bit displaced. Not complaining, just observing- that despite benefiting hugely from being white and middle class, I feel like the willingness of my peers to be complicit with individual, economic and institutional acts of racism is a something that divides us. The recent murder of Oscar Grant and ensuing discussions certainly illuminated the differences in the communities in which I spend time- black and white. Zombie mom, thanks for all your savvy comments. What you note here is a common reality for anti-racist whites, that in between “marginal” reality sociologists often talk about for many groups. The few studies of anti-racist whites show that most feel that way. It too is the result of a racist society. It will only disappear when the racist society disappears. As will the greater pain suffered by those folks of color who are targeted by racism daily and constantly. Correction: Those were not 120 whites, but 120 non-blacks. Even the articles you linked to say “non-black”, not “white”. “Non-black” does not equal “white”. in order for the racist community to change, they need to hear about raising their conscious from a source that they trust. i judge that it does no good to further the cause against racism to confront a near stranger (this includes family members if they are not close friends) about racism. so i’m not rushing to place guilt on these non-blacks. i judge people that confront ignorant behavior in a reactive mood to be divisive, and therefore not helpful to the cause. that nothing was written in diaries, does say to me that racism doesn’t seem to be a major issue for them. but who knows how much the researchers involved influenced the data they received?